Racing in her fifth year as a professional and in her fourth season for UCI Women’s World Tour team Lotto Soudal Ladies, Isabelle Beckers had a comparatively late, yet speedy foray into professional bike racing due to injuries from competitive track and field and many friends telling her, “Just do the same.” The former Belgium 400 meter track star and physical education teacher got her first start in triathlons because “I could ride my bike, I could still do some running, and I could do some swimming,” she explained. After two years of racing triathlons and working full-time as a pharmaceutical sales rep, she eventually found her true calling. Today, aside from her day job racing and pulling domestique duties for her teammates, the multi-talented Beckers works as a curator for La Ridley, a women’s cycling community founded by Ridley where one can read up on a wide variety of topics ranging from everyday questions such as how to fix a flat tire, to stories inside the pro peloton. 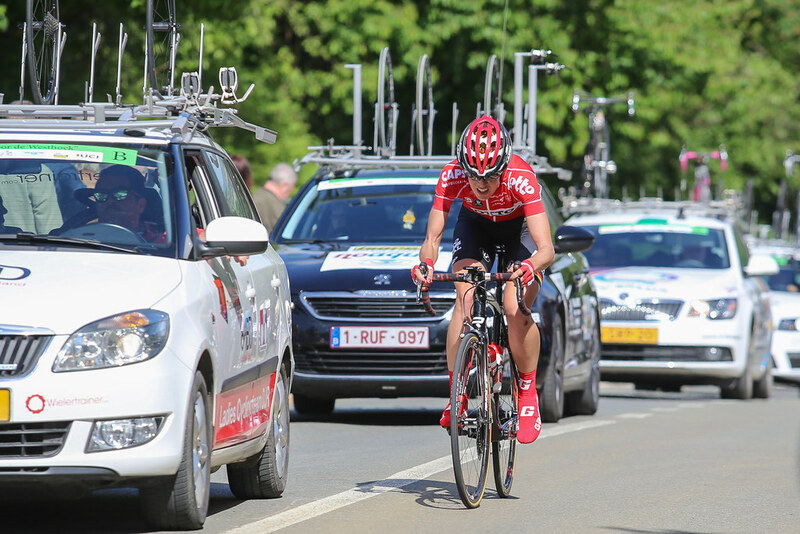 How long have you been riding for Lotto-Soudal? How long have you been racing? I’ve been racing for five years and this is my fourth season with Lotto-Soudal. We were like the last ones. That was such a cool experience also because I had my teammate with me. We were the last ones in the race because they (the commissaires) were taking everybody out. Everybody got dropped. There were riders all over the place and she was the one telling me, “Isabelle, keep eating. Keep drinking. We can do it. We can do it.” And I was like, “Okay Anouk (Rijff), that’s great.” After that she was the one being very hungry and couldn’t do it anymore. The biggest challenge would be getting selected for races like the big classics… And really finish them and do a real good job. My job at the team is mostly to be a helper/domestique. And if I get the chance to be in an early break, I can grab it. What’s on your playlist when you’re warming up for a time trial? Dance music, like Tomorrow Land kind of music. I have never done it but I would love to do the Stelvio. Oudenaarde. Because that is really the center of cycling. That is the center of Tour Flanders. Right there. Do you see any difference in the cycling culture between the US and its European counterpart? The difference I could experience so far is indeed that in the US, people are very serious about their cycling. Training with coaches, schedules, powermeters, newest tech. All the racing on the road and even on the track. I was impressed! Even in every age group! In Europe the amateurs ride their bikes in a less professional way. Power meters you can only find with the pro riders at the moment. What you do see over here is a rising trend in granfondo’s, triathlons etc. The real endurance stuff. People want to make it to the finish line but the result isn’t that important. To say that I am an artist, is a bit over the top, I reckon. I wish I had more time to draw. I work with crayons because I like the texture it gives. A lot of nature, adventure. I don’t really like resorts. I’m not a very touristy kind of girl. I was with the girl scouts and there they give you an animal name during your last year. I was a swallow. They say they’re artistic fliers or something. What about a favorite meal? Meatballs with tomato sauce, together with warm cherries, cherry sauce and mashed potatoes with no gravy. First thing you would do on your first day as a captain of a pirate ship? Just go to a very beautiful island. What would you be your chosen superpower? Is it a Belgian school bus? 10,582,361. What is a coffee ride and what do you do when you’re on one? I’m very good at coffee rides… It’s just riding a little bit and drinking coffee most of the time. We ride much slower than most of the tourists in a coffee ride. It goes really slow, it’s not doing serious stuff because we do that all the time. We look forward to doing coffee rides. It really is part of training and it’s just a day that you can really enjoy bike riding. I basically fell over my first race bike with clipless pedals the first time I hopped on it. My dad was standing there and he brings up that story every time in every race or whatever- whoever he is talking with… Another thing also with pedals. I was lost during our training camp. So we had to stop at a red light and I was all being cool… So I just grabbed a car who was also waiting at the red light, but they had green before me. I nearly fell while the whole team was there. What would you like to see/improve in terms of women racing and cycling? What I would like to see improved in cycling in general, is safety. On the road and in the races. Do you know that team leaders and staff don’t even need a first aid certification to do their job? They are the first arriving at a crash during a race! To me this is just crazy. It’s not even mandatory to have a first aid kit in the team bus/car. We take so many risks during a race but if something goes wrong it could really go wrong. The accident of Stig Broeckx is the perfect example. The ambulance following that day wasn’t even checked before the race. I think first aid courses should be followed by the staff of every single team and every year to be able to get a race license. Women’s cycling could use more professionalism. That all starts with more TV-coverage or media attention. This way sponsors are more interested and budgets could rise. And wouldn’t it be great if it would be mandatory to have a women’s team next to every men’s team at the Pro Tour or World Tour level? They have huge budgets and could make it possible for every girl to get at least a minimal wage. Maybe I’m not thinking realistic but it’s not wrong to dream, right? Anything else you would like to add about your job as a cyclist and as an ambassador at La Ridley our readers should know about? Anything is possible. I’m proof that where there is will, there is a way.